Why book directly with owner? Everyone seems to love AirBnB. But lately AirBnB has started increasing their “booking fees” significantly. As of today, AirBnB is quoting “service fees” of 12.9% on my listings. That means for your $3,000 rental, you are paying a $387 service fee! VRBO does the same thing. Their service fee is between 6-12% “for most bookings but can be above or below, based on the reservation”. So, they can charge you whatever they want and the fee is dynamic so one day it may be 7% and the same rental booked the next day could be 11%. At least on more expensive rentals they cap their fee at $499. AirBnB has no such cap. I’ve seen them quote fees of over $900! That means on your “$3,000” family vacation can easily turn into a $3,400 vacation once they hit you with their “service charge”. Some sites, like Trip Advisor and Booking.com charge even more, though some of them are built into the rental price and you don’t even see them. These major listing sites are using misleading claims such as their “Million dollar guarantees” and fear mongering with warnings of fake owners with fraudulent ads. It is true that there are TONS of scam artists out there posting fake ads on sites like Craigslist, but that doesn’t mean you have to pay the outrageous “service fees” just to be safe. The big sites just want you to think that you do. Not only that, but there are countless stories online of travelers who thought the VRBO’s of the world would have their back, only to be left high and dry when their rentals fell through. Use FaceBook. Lots of owners have their own pages for their vacation rentals. You can search by area or name. Also, check for a local or regional “group” like the LBI, NJ Rentals group. You will find many owners on these groups and you can post what you are looking for or ask for recommendations. Use StaySavr to unveil owner contact info on VRBO. You can use their look up tool by entering the VRBO listing at www.staysavr.com/look/ and find the owner’s name and phone number. Make note if the owner has given the property a “name”….like Moose Lake Cabin or Beach Haven 7. Then go to Google and search for that name, chances are the owner has a website that will allow you to book direct. It is easy for a scammer to copy listing details and photos to Craigslist, but only a “real owner” is going to take the time to build and maintain their own property website. In this day and age it is very easy to identify the true owner of a property. Simply go to the county’s website and look up the property address in the tax records and you will see the name of the owner. Besides, if you are using the same credit card to book directly, your credit card company affords you the same guarantees. 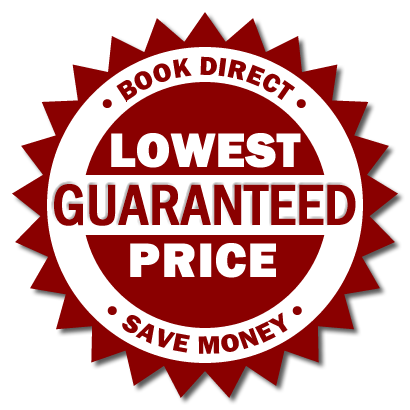 Once you have found the owner’s contact info or website, ask if you can save money booking direct. Most legit owners are set up to take credit cards online and your credit card company protects you exactly the same as they do on VRBO and AirBnB. You don’t need a fake guarantee! You may even be able to save more by paying with a personal check or eCheck if you are comfortable with the owner and have verified that they are legit. These options cost the owner much less than credit cards (3%) and they should pass the savings on to you. I do! Just be careful who you send a check to. I give all my renters my home address and they can verify me through the county’s online records before sending me a dime. So, take a minute and see if you can book directly with the owner. When you book directly, you are saving money, money that is better spent on a nicer home, a day at the amusement park or a family dinner at a restaurant. 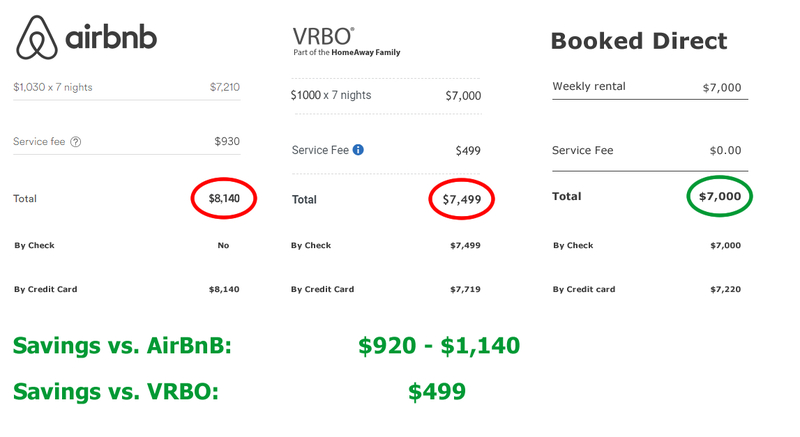 Here is an updated cost comparison of booking a week in our rental – look at those service fees! I love this article. I hope everyone reads it and gets smarter about booking direct!